Titusville Presbyterian invites all people to join in the vision of a new and exciting fellowship of Christian believers who, together, love God and neighbor with all that they have and all that they are. There are no gifts too small to matter! Visit our “Grow” page to see how you can offer yourself through the ministry of leading Christian education and spiritual formation. 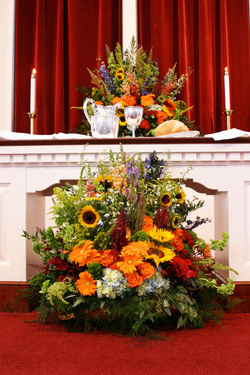 Each week, members and friends give flowers to the glory of God so that our worship space may be beautified with more of God’s fresh handiwork. Call the church office for more information or to sign up. The church hosts a prayer team that lifts up to God the joys and concerns of our congregation. If you are in need of prayer, or if you are willing to pray for others, call the church office for more information. The church also needs regular financial contributions so that material goods may be transformed into active ministry through our programs, our leadership, and our building. There are many ways to give financial resources. First, you can make a gift of cash or check through the Sunday morning offering plate. Second, by visiting your own financial institution’s website, you can sign up for automatic bill pay. This option, which is free for the church and usually free for donors, allows you, by giving the church’s name, address, and phone number, to give a one-time or recurring financial gift to the church. This is a great option for those who wish to give regularly, and without the hassle of needing to remember cash or a checkbook each Sunday. Lastly, by using the button at the bottom of this page, you may make a gift via credit card. While the church welcomes such gifts, please remember two things: the church pays a fee, albeit a low one through our denominational partners at the Presbyterian Mission Exchage, for each transaction and one should remember good stewardship of one’s credit before making a gift this way—the church does not wish to see its members and friends indebted. The church is also able to receive gifts by bequest or other means as one may feel led. Please call the church office and you will be put in touch with someone who has the expertise to discuss these other means of financial giving with you.